Researchers from the Technion-Israel Institute of Technology and Germany have demonstrated for the first time the phenomena of shape memory and self-healing in gold microparticles. Achieved through defects-mediated diffusion in the particle, the discovery could one day lead to the development of micro- and nano-robots capable of self-repair; mechanically stable and damage-tolerant components and devices; and targeted drug delivery. The study, published in the journal Advanced Science, was conducted by doctoral student Oleg Kovalenko and Dr. Leonid Klinger, led by Prof. Eugen Rabkin of the Technion Department of Materials Science and Engineering, together with Dr. Christian Brandl of Karlsruhe Institute of Technology, Germany (KIT). Shape-memory materials are characterized by the ability to repair the damage caused to them (such as plastic deformation) and to recover their original shape. These materials can exist in two stable crystalline forms, or phases: austenite, which is the more symmetrical primary form stable at elevated temperatures; and martensite, which is a phase characterized by lower symmetry, but also by greater strength. A well-known example of transition between the two phases is the quenching of steel. The transformation of the austenite phase to the martensite can be activated by applying mechanical load to the material, or by cooling it down. 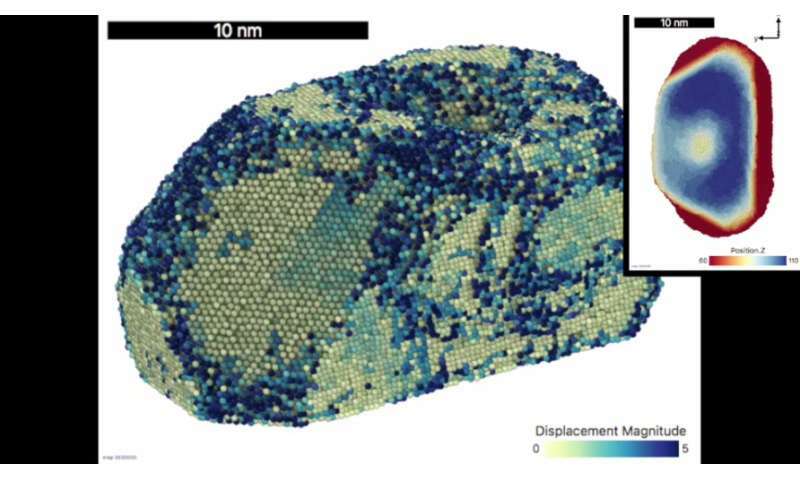 The low-symmetry structure of the martensite allows the material to absorb considerable plastic strain by re-orienting the distorted crystals of martensite according to the direction of the stress applied to it. Even after plastic deformation, the martensite crystals "remember" their parent austenite phase and are capable of restoring it in its original configuration. This will happen if the material is heated up, causing the reverse martensite-austenite phase transformation and transforming the thermal energy into mechanical energy that will restore the material to its original shape. Until now, this shape memory effect has only been observed in very few metal alloys such as Nitinol (Ni-Ti). These alloys are characterized by polymorphism – multiplicity of possible stable crystalline phases. This is the first time the phenomenon of shape memory has been demonstrated in sub-micrometer particles of gold. The researchers indented the gold particles with a sharp diamond tip controlled by an atomic force microscope (AFM). Annealing of the indented particles at a temperature of 600°C (about 65% of the absolute melting temperature of gold) resulted in full healing of the damage and recovery of the particles' original shape prior to deformation. According to Prof. Rabkin, the discovery of the shape memory effect in these particles is surprising for two reasons: "First, the particles' original shape was not perfect in terms of energy and thermodynamic equilibrium. Second, gold in its solid state is not characterized by polymorphism." To understand the process in depth, the researchers investigated the atomic motion during indentation and heating, using atomistic molecular dynamic computer simulations. They demonstrated that the plastic deformation during the indentation process is mediated by nucleation and glide of dislocation half-loops (the dislocations are linear, one-dimensional defects in the crystal through which it undergoes plastic deformation). The loops which egress at the free surfaces form terraces and ledges on the flat facets of the particle, and these serve as "guide rails" directing the diffusion of gold atoms back to the indented site during high-temperature anneal. Thus the particle recovers its original shape. Both plastic deformation and capillary-driven diffusion are classical examples of thermodynamically irreversible processes. It is remarkable that a combination of two irreversible processes can lead to damage recovery and reversible restoration of a particle shape. To understand how surprising this process is, think of spilled coffee jumping back from the floor into the cup, or a car that recovers its original shape after being totaled in an accident. 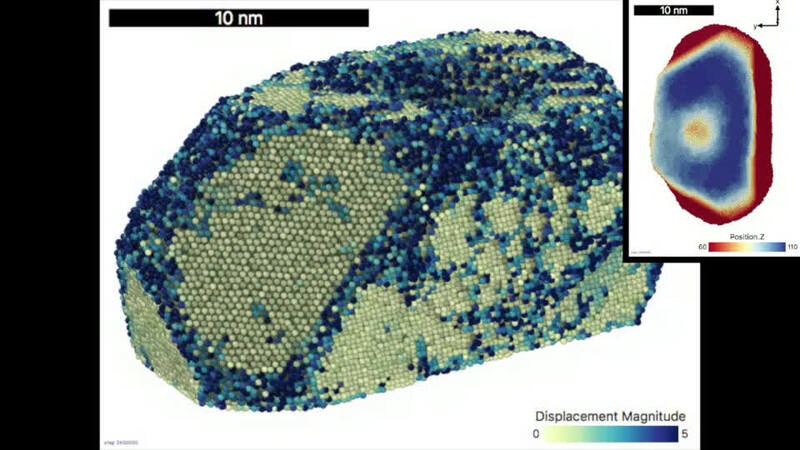 Prof. Rabkin says that the discovered self-healing and shape memory effect in metallic nano- and microparticles could be utilized for the design of mechanically stable and damage-tolerant components and devices at the sub-micrometer length scale. For example, one of the main reasons for the failure of mobile electronic devices (such as tablets and smartphones) is the mechanical wear of electrical contacts. Designing a contact geometry based on the discovered shape memory effect can solve this problem once and for all: electric current flowing through the damaged electrical contact will heat up the contact area, and heat will be utilized to repair the mechanical damage of the contact. Another possible use is the controlled drug delivery to the specific areas of the patient's body. For this application, the particles capable of recovering their shape at lower temperatures should be designed. A drug can be injected into the cavity on the particle surface produced by indentation, and released after heating. Is this related to how gold may be beaten to a very thin film ? ?